Jon, this is such a great blog post and such a hot topic right now. As a social media marketer, I’m seeing this shift both professionally and personally. My brother is 24 and I don’t think he’s ever sent me an email – it’s text or Facebook messages for our communications, no deviation. However, my mum has become an avid emailer over the past couple of years, sending me regular updates from home, yet she herself admits that she finds the concept of Facebook and social sharing ‘weird’. However, I think that email will not ‘die’ as many people claim. Ten years ago people were predicting the death of the paper letter, yet the amount of junk mail on my desk (coupled with invoices, contracts etc.) is testament to the fact that post is still used – and email will be too. However, as you claim, its use will have to alter. You raise the point about speed and immediacy and I think this hits the nail on the head. Couple this with the current trend of ‘curation’ and we can see where email is heading. We live in a content-driven society – and there’s far too much information on the Internet for us all to trawl through, so the ’email newsletter’ is becoming increasingly used as a source of regular curation – ‘here’s what we (and therefore you may) like this month. Email will never die – but by heck, it’s having to change! Your domestic email experience pretty much mirrors mine Callum. There is a clear generational thing going on here. My mother also is a heavy email user. Having been resistant for years she is now pretty reliant on it, just at the time my kids moved away from it. She doesn’t get facebook and won’t play, while my kids simply don’t see why anyone would not do shared conversations and status updates. My older brother got on to Twitter for a while and it was brilliant. We dipped in and out of each other’s lives far more than we did before. I agree with your curation point but am not sure the email newsletter model is the way forward. Rather than have communication pushed out to me I prefer to pull it in and package it myself. Thanks for your contribution to a fascinating debate! Great post Jon, the sentence about instant communication gratification particularly resonated. For me it ignites the debate about the value of timed comms channels, e.g. monthly or bi-monthly/quarterly publications within companies as news is so, well, ‘new’ nowadays. Therefore keeping content relevant and fresh whilst grappling with time-delayed publishing schedules gets increasingly harder as there are more opportunities for employees to share and read news inbetween issues. I agree with Cal’s point about the ’email newsletter’ – my inbox appears to be regularly filled with curated messages. We all know the topic of printed publications is another can of worms which I’m not going to delve into now, however the point I’m making is that regardless of the method we use, understanding how people like to send and receive information, and their timing, is key to providing a range of channels so they can communicate effectively in the manner they prefer. BBM and Facebook/Twitter appear to be the Ferrari of vehicles at the moment, but I don’t think email is dead yet. However it may be that the rust is beginning to appear. Hi Rachel – I’m with you on the timed comms channels. I’m afraid I just don’t see a place for bi-monthly/quarterly publications in the modern workplace. The cost involved in producing this kind or internal ‘organ’ combined with the fact that it is out of date long before it is ‘sent to the printers’ and it has no scope for interactivity makes it a non-starter in my book (sorry, I mean Kindle 😉 Thanks for your comments! Great article, and many interesting points raised! I do not think e-mail will entirely disappear, but other platforms have taken away its appeal (for the moment). I used to use e-mail everyday, and would often have long e-mail conversations with friends and family alike. However with the introduction of Facebook changed that, where people are more likely to check and respond to their Facebook messages than their personal e-mails! I have ended up using that for communications out of habit, and ease. I think it will have to evolve to suit our fast-paced world! I’m not sure that there is any going back. Email began very slowly and took 30 years to evolve in to what we use today. Google and others (including Facebook), are doing their own thing to keep that evolution moving, and as far as I can see the email of the future will bear little resemblance to that of the past. If it does, it won’t be with us for much longer. Thanks for dropping by! Hi Jon! What a fantastic write-up! Many many thanks for putting it together and for sharing it along with all of us! Appreciated as well the link love! It’s interesting how you mentioned above how those of us who have ditched corporate email will have our colleagues “suffering” in this new social networking world, if they are not too familiar with the social tools. And I thought I would comment on that for a second… Yes, you are right, it can be frightening and scary at best, if nothing else happens, but one of the reasons why I have been very successful myself in ditching corporate email, and I am sure the same would work for Prof. Paul Jones, is because we have gone the extra mile and spend a few minutes here and there with our colleagues showing them, teaching them, how to make use of these social tools, so that eventually that learning curve is not as steep as it may seem. In fact, spending as little as 5 minutes per person educating them on how to achieve a particular task using social software has worked wonders for me all along and still the main reason why I continue to make it work. Already in my 4th year and averaging 16 emails per week, which is not too bad, I guess, specially, considering how much people still depend on it. I don’t. I depend on people, they are social, and they are using social tools. That’s where you will find them, and me, connecting and collaborating with one another. Thanks for your kind words Luis – and for not biting my head off for my less than diplomatic turn of phrase in suggesting you and other social mavericks are indulging yourselves at the expense of your colleagues. The truth is I allowed envy to creep into my prose. I have nothing but admiration (and a touch of jealousy) for your stance on email. I’d drop email tomorrow if I could but I would be out of a job within days and I love my job. What I love most about your visit to Riding the ripple is the fact that I didn’t email you or alert you to the fact that I had mentioned you in this post. The social tools you live and breath by brought you here under your own volition. You could have ignored the trail along with my blog post and I’d think nothing of it. However, if I wrote a letter or sent you an email asking for you to contribute to this debate and you turned down my request I’d be disappointed. If you didn’t reply I may consider you rude. As it is neither of us had to contend with these issues because of the power of social media. Great isn’t it! Thanks again for taking the time to contribute! Thanks again for the inspiring post and look forward to further interactions! I find it somewhat frivolous that people honestly believe that email is dead. Whilst I agree that the young generation of today dictates the technology of the future, the fact remains that unless you wipe out 2/3rds of the human population, email cannot die. It may become less prevalent but it certainly cannot die. Just because 1 person in IBM does not use email doesn’t mean email is dead. That’s just personal choice. Register for any site or service and the next piece of information they ask after you name is email address. People dont like change. If you’ve grown up during the era of email you’ll be hard pushed to stop using it. Please note the fax machine still exists! Email is to technology what the CD is to music (I hope I have that right), CDs are slowly being replaced but let’s face it. We all still have cd’s in our house/car right ? And I bet you still have that mix tape from yester year! Businesses invest how much each year in email? To suddenly switch that off and move to collaborative solutions is neither cost effective or even technically possible. How many people in your company know what a wiki is for? But honestly, I agree with Cal’s comments above. Email won’t die, it will change or more likely, fade away. Email serves a valid purpose and until that purpose is no longer required, only then can it be burried in the sky with faxes… Oh hold on! I trust I have made my point. Rant over. @Tony, very very true and happy to take you on that challenge; when I first started this initiative it was just me, 4 years later tracking progress the company has done recent studies / research where we have reduced, substantially, by over 35% our email dependency, which, I am not sure, what you would think, but that’s a whole lot more than just one person. I can give you names of hundreds of fellow IBMers AND customers I interact with on a daily basis without using a single email in between. Quite the opposite, using rather internal or external social software tools. Take your pick. Again, I think we are all agreeing here that email won’t be dead any time soon (Is the Fax dead already? Exactly, my point! ); what we are trying to say is that email is no longer the king of communication and collaboration; it’s just one other option out there, fighting its way amongst several others which are much more effectively. @Luis. Thanks for taking the time to reply. It’s good to see more and more people are embracing Social tools. I totally agree that there are more effective ways to communicate than email but often people fall back into there comfort zone. If main stream email has been around for about 10 years then I predict it will take another 10 year for it to fade away. 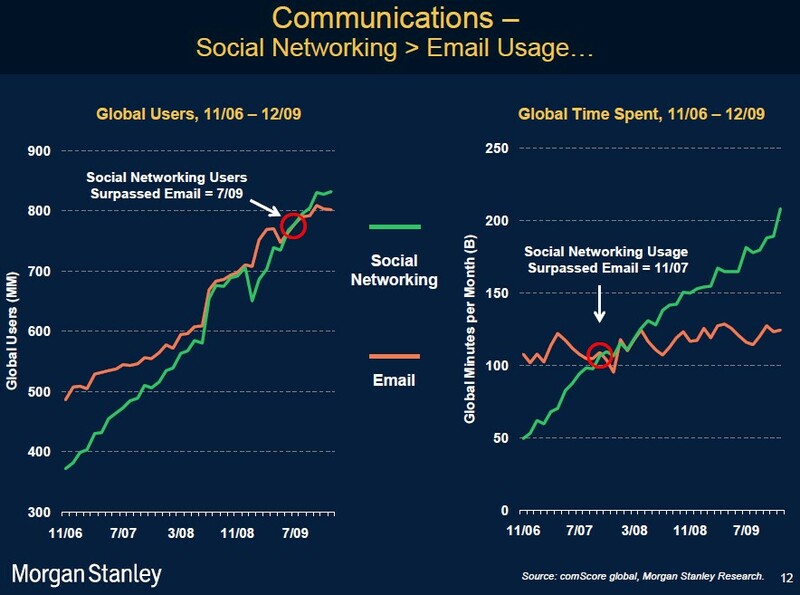 I think it’s also worth pointing out that although time on social sites has gone through the roof email usage hasn’t really changed. The real measure here is productivity. If you can improve productivity whilst using social media then I personally believe that would spell a faster demise of email. But now your into you political challenges and cultural challenges. A whole new ball game. My sole grip here is when people proclaim email is dead. Thank you and please teach me how to have an empty inbox! @tony Excellent – very happy that someone has taken a more contrary position on this, although I think we all agree in the end, that unless it undergoes a pretty radical transformation email will fade away. There seems to be a clear distinction between business and social use of email and it is the social use that is already in terminal decline. @elsua Thanks for taking up Tony’s challenge Luis. Interesting insights from inside IBM, the company whose products were right at the very heart of the invention of email. Tony, in my own experience, and that of those folks who I interact with on a daily basis, social tools are much more effective and efficient than email, therefore making us more productive. As a starting point email has stopped being that delegation machine we have all become addicted to; you may be right it may take us another 10 years to ditch email altogether, but I tell you something, if you take BACN out of the equation (i.e. all of the notifications we receive from social media tools, which I have converted myself into RSS feeds, by the way), I bet the trend of email volume would be falling down at a rampant pace. In my own experience I feel that’s the main reason why I believe email is still around today as much as it is today. Take those notifications out and email has no longer the value it once had. Like I said, I don’t think email is dead or will be dead any time soon. I am just mentioning how it’s no longer the king of our online interactions and has just become another option, in most cases, not the best one, even, for collaboration. First thanks for the link love and the insights, Jon. Tony, I say: “email in name only is #noemail and that’s a good thing too.” as I write about Rockmelt and Facebook moving to change the ways we work in messaging http://ibiblio.org/pjones/blog/rockmelt-facebook-toward-a-social-browser-noemail/ As someone who wrote some of the earlier email programs and interfaces, I can say that email has morphed a lot in 30 years, but not in a way that is very good and is getting worse despite Gmail’s best efforts to make email make sense. All studies now show that email is by far a bigger time sink than all other social media combined. One reason is that people, believe it or not, seem to be better at moderating and restricting their own social media use — with some additional help from their employers ;-> The only timesink greater than email? Telephone. How to get an empty inbox? Send mail to jones@unc.edu and read my away message. It’s all a work in progress, but it’s progressing. Luis’ experience and advice has been invaluable. Luke, I’d love to read your article, but, like Jon, I can’t access it. @smalljones It kinda proves something that like @elsua you found your way here without a formal invitation. I’ll say it again. Living proof of the power of social media. Thanks for joining the discussion, I’ll be watching your #nomail experiment with great interest. Obviously I had to take your advice and email you. I hope you don’t mind me sharing your away message here to save readers firing up their email client! communicate and to get our work done. Have ibiblio.org questions, suggestions or problems? http://www.ibiblio.org/help/ is your best way to access our team. I’ll probably be on freenode too. More details on that later. I’m also open to other suggestions; please feel free to send me your good ideas. With a month lead, you can learn and adjust a lot of things and make your life and your correspondents lives easier too.